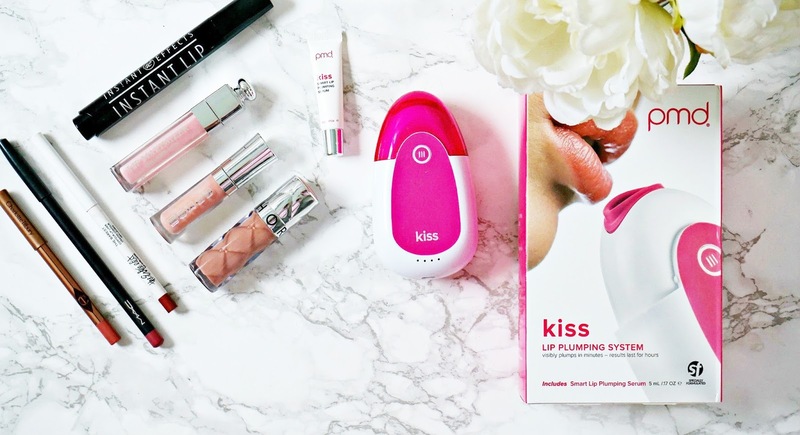 The first product is PMD Kiss, which is a lip plumping device that uses a pulsating vacuum technology to plump the lips. It comes with a lip plumping serum, which is applied to the lips and then the device is applied to the lips in 6 sections - right, middle and left of each lip, for 15-20 pulses on each section. It isn't painful at all but it is a strange sensation as your lips literally feel like they are being sucked! The first time I used it, my Mam arrived at the door when I had just finished with it and she thought that I had had an allergic reaction to something as my lips were so "swollen" - I had to tell her that it was self-inflicted and her bemused face was a picture! That alone will tell you that this device obviously works in plumping the lips and I think it would work really for those with thin lips - personally, my bottom lip is quite plump but my top lip is thinner so I have been using it to even them up, but if you have thin lips, you would notice a bigger difference, especially with daily use. It isn't the cheapest product at £125/€139, however it is a hell of a lot cheaper than fillers, it's less invasive and it gives good (albeit temporary) results - lips are smooth and plump without any of the pain or bumps that fillers can give. For a temporary, affordable, quick fix, I recommend Instant Effects Lip Plumper. This product smooths any lines away and plumps the lips and is the perfect product to use after exfoliating your lips and before applying your product of choice, but works particularly well under drying liquid lipsticks. After that, it's down to 'cheating' your way to a fuller pout by using products in a clever way. I like to contour my lips using one or two lip pencils before applying a gloss. My favourites are MAC Soar, Charlotte Tilbury Lip Cheat Pillow Talk and The Estée Edit The Barest Contour Lip Liner. Pillow Talk is the closest to my natural lip colour so I can overline my lip without it looking too obvious and the other two can be used to contour my lips - the overall result is that they look fuller and more even. The glosses that I like to use are Buxom Lip Cream in the shade White Russian, Sephora Collection Outrageous Effect Volume Lip Gloss and Dior Addict Lip Maximiser. All of these glosses are very plumping and have a slight tingle to them when applied, but nothing uncomfortable. Combined with the other products, my lips definitely look more plump than they are naturally. Do you use products to make your pout look fuller? Would you be tempted by fillers or are you happy to use products to achieve plump lips? I'd love to hear! Edited to add that some readers were worried that the PMD Kiss would cause long-term damage but according to PMD, it doesn’t cause any damage – actually, it helps to build collagen in the skin as it improves blood circulation. So, it’s a really good device for keeping lips (and area around the lips) looking young and wrinkle-free. All products are bought by me, unless otherwise stated. The PMD Kiss was kindly sent to me. Opinion is always my own.